Mexico City is one of the largest cities in the world and Mexico’s cosmopolitan capital. This charming destination was built over the remains of an Aztec city, so there is a lot of rich history to discover in the form of colonial architecture and captivating archaeological sites. Mexico City also has modern appeal with its glistening skyscraper buildings and other contemporary edifices, creating a unique blend of past and present. Visitors can look forward to exploring and experiencing eclectic neighbourhoods, excellent shopping hubs, world-class cultural venues, lush green spaces, trendy night spots, beautiful beaches, some of the world’s finest dining establishments and much more. Brightsun Travel has an excellent range of cheap tickets to Mexico City, so you can come and explore this vibrant capital for yourself. Mexico City is an immense cultural centre with over 150 world-class museums and galleries to explore. Start at the captivating Templo Mayor Museum, which highlights the history of the Templo Mayor temple site with an incredible array of artefacts. Then visit the National Museum of Anthropology, an architectural marvel and one of the city’s most significant cultural venues with a collection of Mexican artefacts, sculptures, paintings and ethnographic objects. To admire some of Mexico’s art masterpieces, head to the National Art Museum, a stunning contemporary building which displays art ranging from the 16th–20th century, with both permanent and temporary exhibits. There are also plenty of other special interest museums in Mexico City, catering for all tastes. A trip to Mexico City is not complete without visiting the Centro Historico, which is where the city’s most iconic landmarks are situated, including museums, architectural wonders and ancient Aztec ruins. The centre’s main square, the Zócalo is an explorer’s haven. The world-class Metropolitan Cathedral and the fascinating Templo Mayor temple ruins are situated here, and there are Aztec dance performances to enjoy here daily. If you prefer beaches and landscapes, then why not head to the resort town of Puerto Vallarta to admire lots of lush rainforest, breath-taking mountains and pristine Pacific coastlines; the beaches here offer plenty of exciting activities including whale watching, snorkelling, diving and surfing. 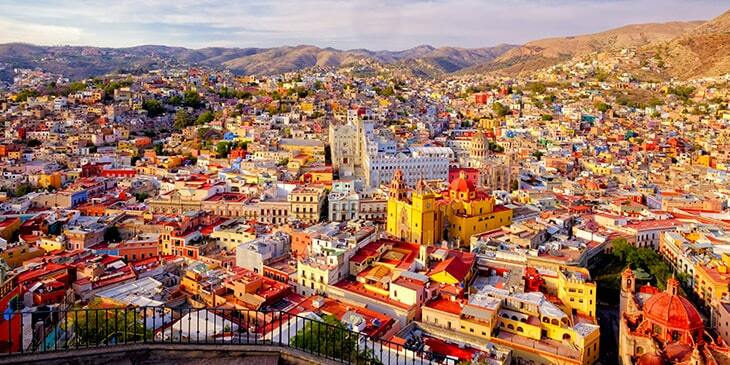 Book Mexico City flights from India and look forward to the ultimate city break!